ST. PETERSBURG, Fla. – RT’s Bo Jangles, the national win leader and All-America first-team selection in 2017, has been retired from racing. 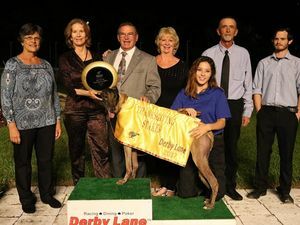 A champion of three stakes races and two-time meet win leader at Derby Lane, RT’s Bo Jangles raced for the final time this past Saturday – finishing sixth in a Grade B sprint. It was his third start since returning Jan. 30 from a four-month layoff because of injury. RT’s Bo Jangle raced exclusively at Derby Lane with Cal Holland kennel, and scored 88 victories from 148 starts for owner Randy Toler of Penrose, Colo. Named after the song, Mr. Bojangles – a popular tune in the 1970s – the 46-month-old son of Kiowa Mon Manny and Penrose Karrie became an instant fan favorite. RT’s Bo Jangles started his racing career in September, 2016. The 550-yard specialist didn’t win his first Grade A race until his 20th start, but became a force after that. A month later, RT’s Bo Jangles won the $10,000 Thanksgiving Stakes. It was one of his 45 victories in 2017, when he captured both Derby Lane six-month meet win titles and the national win crown. RT’s Bo Jangles’ final stakes triumph came in the $8,000 T.L. Weaver Memorial Challenge in 2018. He clocked a career-best time of 30.04 seconds this past September in the second round of the $50,000 Husker Magic Fall Sprint. That would his final victory. 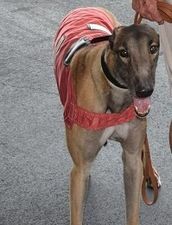 The fawn-colored greyhound was injured in his ensuing start, and failed to return to top form. RT’s Bo Jangles was a steady performer, highlighted by an eight-race win streak. He also won six in a row three times. RT’s Bo Jangles wound up with 124 in-the-money performances with top four finishes, and $70,531 in career earnings.